This is a gloriously unfashionable and unhealthy dessert, which makes any meal seem like a special occasion. Like Beef Stroganoff, I hadn’t made this for absolutely ages, but a 36-hour powercut was a great opportunity to think of a dessert that doesn’t require the oven and uses ingredients that are to hand. Of course it doesn’t do to make it too often, but once in a while it makes a lovely treat. It is not at all complicated to do, especially as you can prepare the pancakes and butter in advance — the day before if you want. 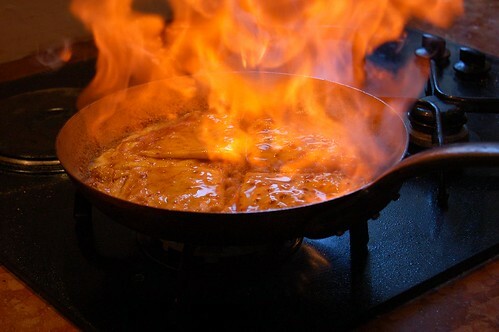 You really should entertain your guests by flambéing it at the table. Note: this makes enough sauce for about 8-10 pancakes, and unless you are really greedy, 2-3 per person are ample. You will probably have some pancakes left over as the batter recipe makes about 12-16, depending on size. You can only flambé a maximum of 8 pancakes at a time, so you’ll need to cook them in two pans if you are doing more than that. For the pancakes, just whisk together all ingredients till perfectly smooth. Set aside for an hour. Then heat a suitable pan, lightly grease it (I just wipe round with a piece of kitchen paper dipped in oil) and cook the pancakes, making them as thin as possible. As they are done, stack them on a plate, covering them with a tea towel. Once they are all done, you can refrigerate until needed, removing them from the fridge half an hour or so before you want to cook them. To make the butter, put the grated zest in a bowl (the Microplane box grater Steve gave me for Christmas is fantastic for this) and add the icing sugar and butter, which must be really soft. Beat together thoroughly, then little by little beat in the juice and liqueur. Refrigerate until needed; again you’ll need to get it out about an hour in advance of cooking so that it softens enough to spread. When you are ready, spread one side of each pancake with a teaspoon or so of orange butter, then fold into quarters so it makes a fan shape. Melt the butter for the sauce in a saute pan and add the sugar. 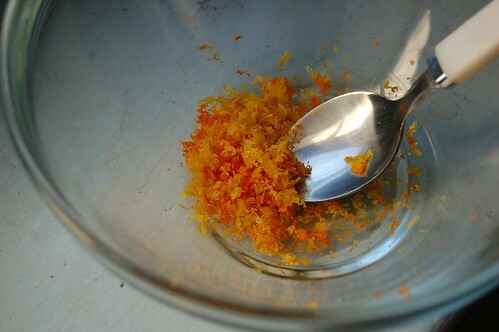 Let it caramelize slightly, then add the orange juice, stirring till hot. Put in as many folded pancakes as will fit, and let them warm through in the sauce, turning each pancake once or twice with a spatula or slice. When it’s all nice and bubbly and hot, pour over your alcohol and set fire to it, using common sense to avoid the flames shooting up into your face — if cooking on gas, you can just tilt the pan towards the flame for instant conflagration. Serve immediately the flames have died down. Looks delicious! Something I would never think of making at home, but now I’m inspired. Yes you have inspired me too. I remember this being made for me in a London restaurant when I was in my early twenties. The fire, the expertise and the taste have stayed with me over the years. I’m going to make this as soon as I’ve saved enough cash for the Cointreau. Thank you, Veronica. I too have happy memories of a glorious blowout of a meal culminating in crêpes Suzette flambéed at the table — over 25 years ago! A much more agreeable way of waiting for a delayed ferry than sitting grumpily in the ferry terminal with everyone else. Incidentally, maybe you could make a lemon version with your lemon gin? Unfashionable? Pshaw! These look the height of elegance!